LEGO and I continue to be pen pals. And by pen pals, I mean I send them money and, in return, they send me publications and sets in the mail. 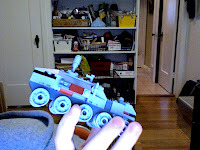 The latest is the Star Wars battle tank- the monthly installment from my BrickMaster membership. It's a mechanized hoagie rolling on hubcaps, which means it looks cool from certain angles and entirely too boxy from others. But I'm evolving as a builder. I've learned to outsource the smaller projects so I have time to focus on the larger things I'm hoping to build. The tank you see pictured here was contracted out...to my wife. It takes about one "My Name is Earl" episode to put together (minus the commercials, courtesy of TiVo). I may outsource in the future, it depends on the size of the invoice I receive.